Hey y'all!! Cheesium ended and I decided to close down the forum due to inactivity! I know the site is a mess, (had to retrieve a backup from archive.org lol), but I thought I'd leave it up because it tells a story. Our story. I haven't been able to plot this all down before. I feel like now is a good time to piece everything together about Cheesium. Everything is in chronological order. Feel free to PM me if I'm wrong or inaccurate about something. Next came Mortalis Grief City. Tabithia had left for college and so she let me change the whole server structure. Mortalis GC was pretty darn popular, some players like Chloe, Skywalker_Jedi, Applenick3, ScientificGamer played way back then. This was 2012. 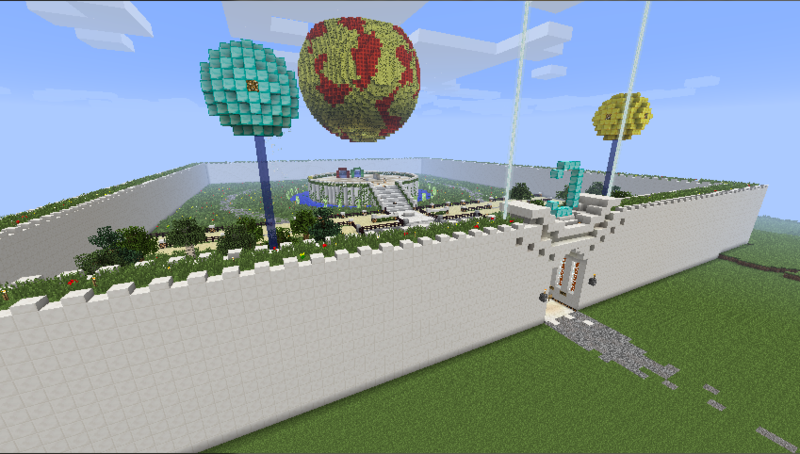 I decided to try out hunger games and completely morphed Mortalis into a hunger games server. Bad turnout. Really bad turnout. ScientificGamer and I trashed it and came up with a new name, Cheesium, solely on the idea of free item spawning. I started doing Cheesium by myself, Skywalker and ScientificGamer as prime staff members. This was one of the high points of Cheesium. People astonished by the idea of item-spawning came from all over. 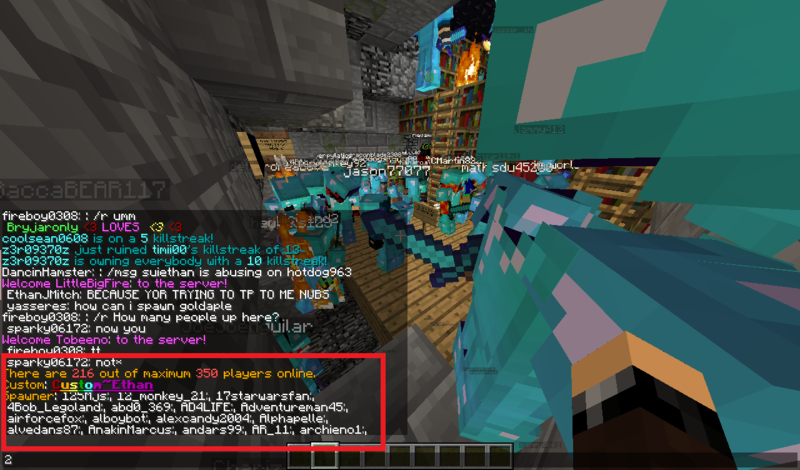 One time, we set a high at ~135 players on (during one of the new Minecraft updates). Overall, we had an average of 50-60 players online. I am not kididng you :O I specifically remember doing the pirate ship on ice spawn, dragon spawn, and giant's pants spawn, during this time period. Haha, the application wasn't the best, but he soon purchased a $80 D-Admin rank and worked his way to the real Co-Owner position in late summer. By then I was getting caught up in freshman/sophomore highschool homework and he was left with the brunt of the work. Player base varied from 30-80 players. I thought Apple and I were the best team ever. I still miss this dude today. Applenick later resigned due to me overloading him and not respecting him. I admit I wasn't a good sidekick and even today, I regret my neglectful actions towards him. If you're reading this Applenick, I sincerely apologize to you, you really deserve something great in life man. Other good staff like skywalkerjedi and scientificgamer also left. Evan52098 soon came along in 2013. Things clicked and he got me out of many sticky situations. His maturity also outshone the rest. He soon became the next co-owner of Cheesium as I still had nostalgia amounting from Applenick's resign and I wasn't used to working alone. Months later we got 4.6 million subscriber JeromeASF to record on our server. Txboy was also present as a Head Admin during this process. It was a big hype for sure and one of the best experiences I've had. 230 players? Damn, we were like hypixel ahaha. 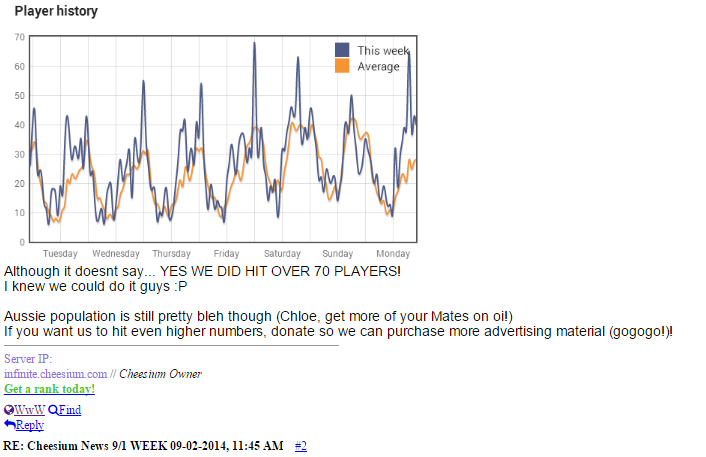 We later settled down to avg 60-80 players. Minecraft updates came and went. Enchant tower here, enchant tower there. Late spring of 2014, when finals and AP tests were in action, Evan, too, stepped down from co-owner and also demolished the whole Cheesium forums. While my excuse was of school, his constant isolation and lack of my involvement left him in anger. I only wish I could have been more active, preventing the later decline of Cheesium. Some more staff left along with him (Italian, Txboy, although not 100% sure). Volxme came along in the summer of 2014 with CheesiumNetwork. It was worth a shot, but nothing came out in the end. We were currently at 30-50, usually 40 active players. From then on, my activity declined and declined. I had spent hours and hours doing homework and writing my college applications. No time for Cheesium. OneShot, Chloe, Snorskan, - these guys basically ran Cheesium from Fall 2014/2015 onwards. Cheesium staggered at 20-30 players. They were promoted as owners from January 2015 to late March. Again, things didn't go as planned and actually Cheesium was officially dead for a week in March. Now, TheBigBurf101 is handling Cheesium. From what I've seen, he's a professional, mature Aussie who knows what he's doing. I have great trust in him and he's exhibited great leadership so far. He listens to the community, lets people speak their minds, conforms rather than argues, and has a plan for this community. Have trust in him and we will get back to our old playerbases. Maybe slowly, but surely. I just know it. I haven't moved on from Cheesium yet. Not by far. But I have great things in store for college next year. I'd like to thank everybody that has ever helped Cheesium in anyway, and to thank all everybody in the community for making Cheesium what it is today.